A sturdy, tough terrier, very much on its toes all the time. The body length must be in proportion to the height, and it should present a compact, balanced image, always being in solid, hard condition. The head Should be well balanced and in proportion to the body. The skull should be flat, of moderate width at the ears, narrowing to the eyes. There should be a defined stop but not overpronounced. The length of the muzzle from the nose to the stop should be slightly shorter than the distance from the stop to the occiput. The nose should be black. The jaw should be powerful and well boned with strongly muscled cheeks. Eyes Should be almond shaped, dark in color and full of life and intelligence. The ears are small "V" shaped drop ears carried forward close to the head and of moderate thickness. Mouth Strong teeth with the top slightly overlapping the lower. Two bites are acceptable; level and scissor - scissor being preferred. The neck is clean and muscular, of good length, gradually widening at the shoulders. The shoulders should be sloping and well laid back, fine at points and clearly cut at the withers. Forelegs should be strong and straight boned with joints in correct alignment. Elbows hanging perpendicular to the body and working free of the sides. The chest should be shallow, narrow and the front legs not too widely apart, giving an athletic, rather than heavily chested appearance. As a guide only, the chest should be small enough to be easily spanned behind the shoulders, by average sized hands, when the terrier is in a fit, working condition. The back should be strong, straight and, in comparison to the height of the terrier, give a balanced image. The loin should be slightly arched. The hindquarters should be strong and muscular, well put together with good angulation and bend of stifle, giving plenty of drive and propulsion. Looking from behind, the hocks must be straight. The feet are round, hard padded, wide, of cat-like appearance, neither turning in nor out. The tail should be set rather high, carried gaily and in proportion to body length, usually about four inches long, providing a good hand-hold. The coat is smooth, without being so sparse as not to provide a certain amount of protection from the elements and undergrowth. Rough or broken coated, without being woolly. Colors, white should predominate (i.e., must be more than 51% white) with tan, black, or brown markings. Brindle markings are unacceptable. Gait movement should be free, lively, well coordinated with straight action in front and behind. Old scars or injuries, the result of work or accident, should not be allowed to prejudice a terrier"s chance in the show ring unless they interfere with its movement or with its utility for work or stud. 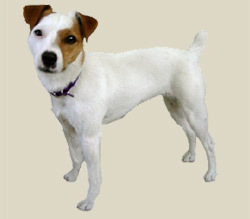 An Irish-type called Jack Russell Shortys have shorter legs than the English-type. This is a dog that thrives on action and adventure. In the process, it often finds itself in the middle of trouble. It is a true hunter at heart, and will explore, wander, chase and dig when it gets a chance. It is very playful and intelligent. It gets along well with children and strangers. It can be scrappy with strange dogs, but is better than many terriers. It does well with horses, but it may chase cats and is not good with rodents. It may tend to bark and dig. It makes an ideal companion for an active person with a good sense of humor who wants a lot of entertainment ? and mischief ?in one dog. All coat types are easy to groom. Comb and brush regularly with a firm bristle brush, and bathe only when necessary. To show, owners must strip the coat. Like the rough coat, the broken coated Jack needs to be stripped out also.